Enthusiast Xou Vang spent this last weekend bidding for a used Nissan GT-R on eBay and, at $55,100, thought he'd gotten a fair price for his dream car. The dealer, Honda of San Marcos, thought the deal was too fair and reportedly said they'd refuse their deal unless he coughed up a few grand more. UPDATE: The dealership's caved under your pressure and Xuo Vang's getting the car at the initial sale price! Car dealers sell hundreds of cars on eBay every day, often sparing the buyer and salesman from having to go round-to-round in a stuffy back office situated a long, contemplative walk from the manager's office. Unfortunately, some dealers bring this experience to eBay. Unlike some of the stories of poor eBay Motors salesmanship where the dealer ended up selling the car for a large discount, the case involving Vang is over an embarrassingly small amount. 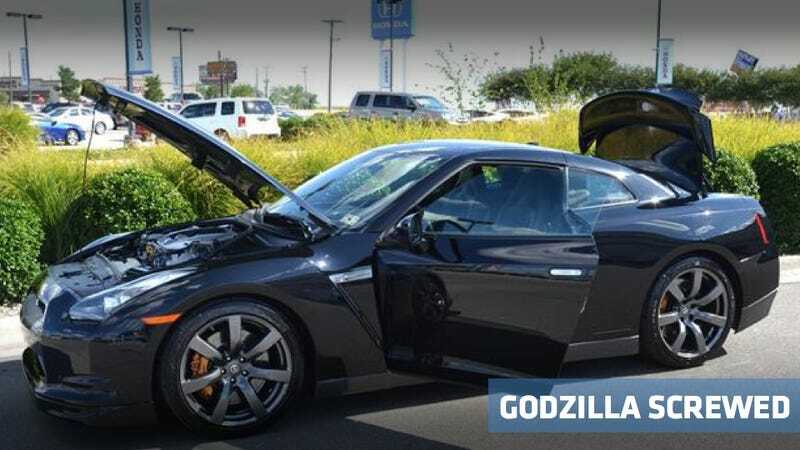 According to Vang, he won the auction for the single-owner GT-R on Sunday night at a not unreasonable price of $55,100 for a car the dealership originally only wanted $59,000 for (and is now for sale for $62,000), and attempted to contact the dealer to find out the best way to submit his deposit. The next day he called the dealership and, after getting the run around, finally connected with the Used Car Manager Ian Jones. Jones, apparently, claimed the rules of eBay Motors don't apply to dealerships, that the car should have included a reserve though no one put it on the listing, and that Vang would have to pay full price. "Ian said he was aware that situation but I'd have to pay the asking price of $59K, which I'd already said was unfair," said Vang. "I won the auction and I wasted the time and effort to win it and now they won't sell me the car because that's not the price I'm looking at." Vang later tried to submit his deposit since that was part of the original eBay contract listed online but reportedly Ian refused to accept it. The car is now listed on the Honda of San Marcos site as for sale for $62,674 after being previously listed as sold. Mr. Vang has engaged in slander against Honda of San Marcos and attempted to purposley (sp) and unlawfully disrupt the dealership's ability to operate. As a result of these documented offenses and on advice from counsel Honda San Marcos will not discuss this matter with the BBB." They also have so far refused to discuss it with us. We attempted to reach out to the dealership, but Internet Sales Manager Raymond Ammons refused to discuss it. We were also told the owner was "out of town" for a week and the used car sales manager was "in a meeting." Not selling cars to people is serious business. We are reaching out to the dealer to confirm what happened. If the buyer's story is accurate, this behavior is in direct violation of the eBay User agreement. The eBay Dealer team will contact the Seller immediately and if warranted notify them of their violation of the user agreement. If the Seller fails to comply, and has further incidences like this, eBay may either limit or suspend account privileges. They are willing to honor my price of $55,100 and the owner wants to talk to me to get a resolution. Thanks again for all your help. Good work, Team Jalopnik Cotomer Sevis!